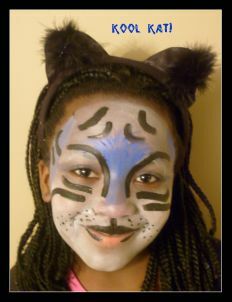 Kid face painting is a BIG favorite amongst children ages 3 to 99!! 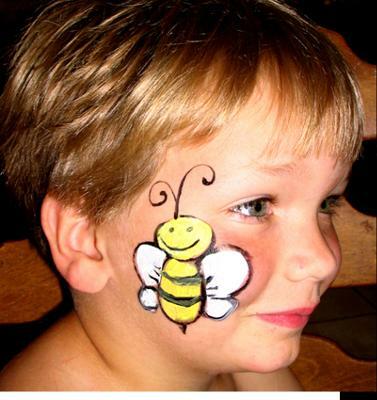 You’ll find great face painting birthday party ideas on this page. Kids should put their hair back with a clip / hairband. Clean their faces with a moisture wipe or tissue. Prepare lots of towels and tissues & have a few mirrors available. Prepare different sized brushes & sponges. Prepare a few bowls filled with warm water for cleaning the brushes when changing colors. When switching colors, the brushes/sponges/fingers need to be washed. However, make sure to dry them off with tissues/towels completely because excess water will make the face painting colors runny. Prepare stencils of stars, moons, flowers, hearts, etc. to apply on the cheek if you are not comfortable painting free-hand. You should start with the lightest colors (while it is possible to use white over black you will get a much bolder contrast when you paint black over white). Make sure to let the first color dry before applying a second. If not, the colors will mix and you’ll probably have to wipe everything off and start again. Think thin. Rather than applying one thick layer of paint (which may crack) apply a thin layer, let it dry, and then apply another. 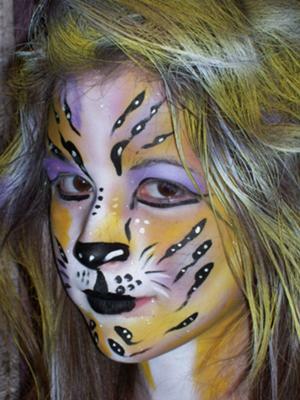 Go for some special face painting effects! The paint works as a basic glue, so you can create funny features like bumpy noses or big eyebrows. For warts, take puffed rice, cover with a piece of tissue, paint and glue on to the face. For big eyebrows soak a bit of cotton wool in the paint, place on the face, cover with a piece of tissue, and paint. If you want a ghostly effect apply a light dusting of flour once you’ve finished painting the face (be sure to get your subject to close their eyes tightly). 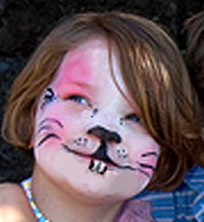 Glitter is also great for a quick, dramatic face painting effect. 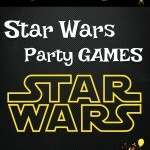 But, keep in mind that it can scatter everywhere and “stick” around for quite some after the party has ended. If there’s a kid that has a cut or open wound, fever, disease (like chicken pox) DO NOT PAINT THEM!! In these matters use common sense and avoid such problems. If you are concerned that someone may have very sensitive skin, you can first start by applying a little paint on the inside of their wrist and wait at least half an hour to see if there’s a reaction. Make sure you are super careful when painting close to the eyes. Have them look up when painting below the eyes, and eyes shut when painting above them. 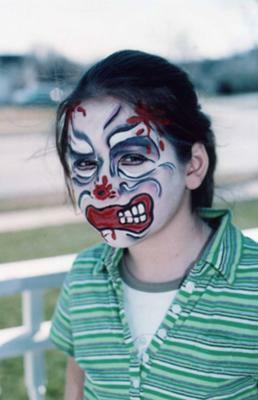 Always use an approved face paint makeup. Acrylic and craft paint are not for use on the skin… don’t risk it on your child or anyone else! With the same sponge add pink to cheeks and above eye. Using a paintbrush add black lines: nose, whisker and whisker dots, and teeth are the most important parts. Using a big round brush draw 2 yellow ovals; one horizontal, one vertical. Add 2 white half circles to each side of your bee body. Add a simple smile face and stripes once the yellow paint is dry. Add curly antenna and small triangle as a stinger on the bottom. Nowadays, face paints are quite cheap and available pretty much everywhere. However, if you’re into brewing your own potions, why not make your own face paints with this easy recipe. Combine about half a cup of face lotion (or cold cream) with two tablespoons of cornstarch in a bowl. Continue to add cornstarch until you reach the desired texture (this is the base). You’ll then want to mix your own colors, so put the base mixture you’ve just created into three small containers. Then, add food coloring to each container: Red, Blue, and Yellow (mix each color so that they are two times darker then what you want them to show up on the face). Red, Blue and Yellow are the base colors for all the rest of the colors. For instance blue and red make purple, blue and yellow make green, red and yellow make orange, white with red is pink, etc. So with these three colors you can make an array of more colors. Two things to take in account: 1) It takes this face paint a while to dry, so make sure you tell the kids before you paint their faces. 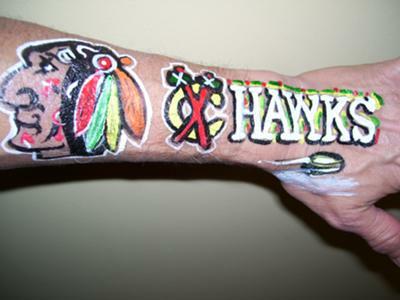 2) Paint it on thinly if you want your drawings to keep on face (cold cream slides off and is sweat off easily).